Together with their son Nicky, who crossed his first ocean at age four, the authors have spent four years living and cruising aboard their Dufour 35 Namani, first sailing from Greece to the Caribbean and on to Maine, then from Maine to Australia. They’ve compiled a very readable cruising guide that covers everything from buying and equipping a boat, preparing for a long passage, understanding weather, and safety at sea to detailed information about the islands along the route, from Panama to the Galapagos Islands, Marquesas, Tuamotus, Society Islands, Cook Islands, Tonga, Fiji, Vanuatu, and New Caledonia. 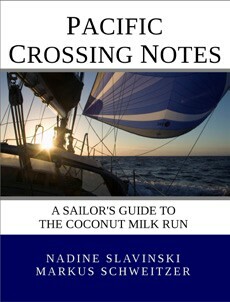 Nadine Slavinski has written several books, including Lesson Plans Ahoy: Hands-On Learning for Sailing Children and Home Schooling Sailors and Cruising the Caribbean with Kids: Fun, Facts, and Educational Activities. Her article “Pot of Gold” won first place in the 2014 Boating Writers International contest. With a background in engineering and computational mathematics, Markus Schweitzer worked in the tourism, logistics and aviation industries before casting off the shorelines. Whether you’re an armchair sailor looking for a good story or a voyager contemplating a crossing of the world’s largest ocean, Pacific Crossing Notes is worthy of a place in your library. It’s also available as an ebook edition for $4.99. For other links and resources and the authors’ informative blog posts, visit nslavinski.com and namaniatsea.org.